April 19, 2016 — The Boettcher Foundation is pleased to announce that Rita B. Contreras has joined the staff as executive assistant. Contreras brings more than 20 years of experience in politics and higher-education with a focus on empowering others to access resources to improve their quality of life. Contreras has served as a city council aide for nine different members of Denver’s City Council. She also served as a constituent services and outreach representative for Congressman Ed Perlmutter, and as executive assistant to the president’s chief of staff at Metropolitan State University of Denver. “Rita’s experience and her ability to engage with members of the community make her the ideal person to support the Boettcher Foundation’s executives as we engage with the dynamic thinkers and leaders who propel Colorado forward,” said Katie Kramer, vice president and assistant executive director of the Boettcher Foundation. A Colorado native, Contreras attended Denver Public Schools, graduated from North High School and pursued a double major at Regis University; a Bachelor of Science in psychology, and a Bachelor of Arts in communications. She is also a 1998 graduate of the Denver Community Leadership Forum at the University of Colorado Denver. “I am excited to be a part of an organization that shares my passion for helping people to improve our communities,” Contreras said. 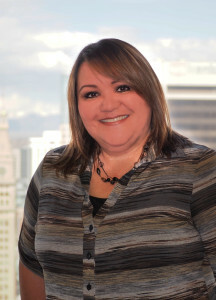 Contreras is active in the community and serves on the Denver Art Museum’s Latino Outreach Committee and the Denver Health and Human Services Citizens Review Panel. She and her husband, DJ, enjoy coaching and actively cheering on their two young sons during their football, soccer and baseball games. Having recently lost their nine-year-old son to cancer, the family spends much of their free time volunteering with organizations that help raise awareness and provide support to other families as they navigate through their journey of dealing with childhood cancer.